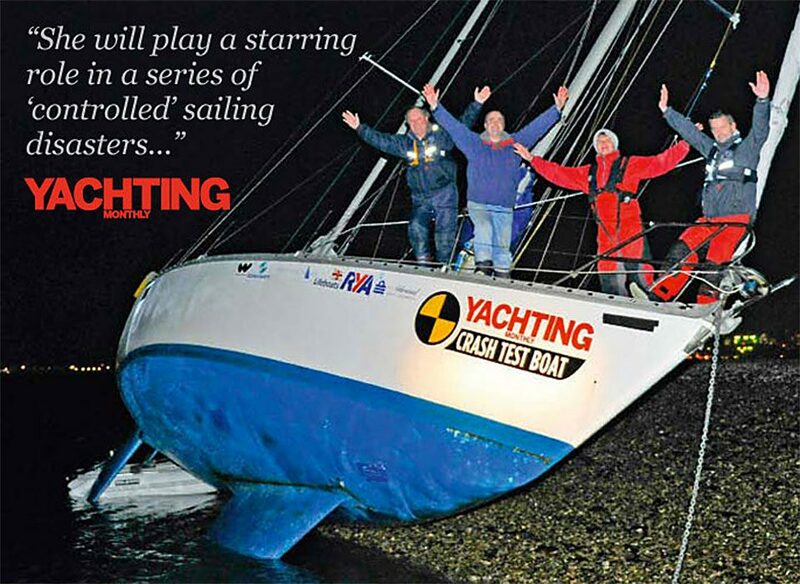 Readers of Yachting Monthly and followers of yachting videos on portals such as You Tube, will have noticed our involvement as principal participant within the “Crash Test Boat Series” – an initiative for 2011 launched by editor, Paul Gelder, with the intention of replicating a series of “controlled” sailing disasters, the results of which are listed below. Running Aground – What Works? Measures ranging from simple to increasingly desperate in order to refloat the yacht from various grounding scenarios. Can it be made safe down below or become a hell-hole in the unlikely event of a capsize or knockdown? A dismasting and aftermath caught on camera under controlled conditions. An unlucky crew set about creating a jury rig from what was left on board, resulting in this elegant square rigger. Ten ways of saving a sinking yacht are tested. Leaking! What Plugs a Hole? Whether it’s a seacock or a log transducer that fails what can you use to stop a leak? Fire in the Galley! What to Do? Fires were started in the galley and engine room and put out using existing equipment, all of which was out-of-date. The yacht was anchored in 8m and a 200m exclusion zone was set up before simulating a shocking gas explosion. Why would Admiral trust a yacht to this lot? Robert Holbrook, Managing Director of Admiral, has seen all sorts of yachting disasters – from UK coastal dramas to mid-ocean calamities – and has dealt with many insurance clients who have fallen victim to the unexpected or the unavoidable. A keen cruising and racing yachtsman, Robert is sponsoring a series of ‘crash tests’ to be carried out by the daring folk at Yachting Monthly. The Crash Test Boat series will help promote safety and good seamanship – ultimately a good result for all concerned! Download the full, unabridged Yachting Monthly articles in PDF format below for reading at your leisure. Admiral Yacht Insurance is underwritten by certain underwriters at Lloyd’s (Watkins Syndicate, Syndicate 457). Lloyd’s enjoys strong financial security supported by excellent ratings. Visit www.lloyds.com for more information. The policy is written in plain English so a knowledge of marine law is not required to understand it. In fact, we are so confident about our policy that we offer a money back guarantee – just tell us in writing, within 14 days, if you are not satisfied with the policy. To get a yacht insurance quote please telephone Admiral on +44 (0)1722 416106 or use the buttons below to either request a call back from our specialist team or to get a yacht insurance quote online.